The Pensacola State Collegiate High School is an accelerated program for motivated students. It is not an alternative school for trouble students looking for a second chance. Students are carefully screened prior to enrollment into Collegiate High School. 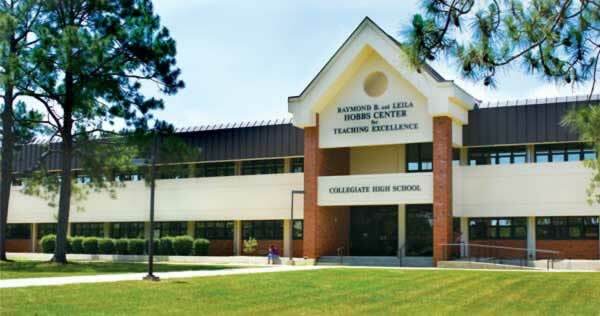 Pensacola State College Collegiate High School (CHS) has a rolling admissions process, meaning the high school accepts new students year around. However, if you plan to start classes in the fall, spring, or summer, you will want to submit your admission paperwork to the Collegiate High School Student Services Office in building 11, room 1113 during the priority period. If you have any questions or would like further information please contact 850-484-2177. If your child is in need of medical assistance the Pensacola State College has a full-time medical staff at Health Clinic which located in Building 3, the Health Clinic is available to students in the event of an accident or illness on campus to assist in medical needs, and if necessary will contact off-campus emergency care if needed. If the Health Clinic nurse is needed at the scene of an accident or emergency illness, Pensacola State College Police should be contacted at 484-1322. Students shall not possess, dispense or share prescription or non-prescription medication. The student is a dependent according to the Federal Internal Revenue Code. The parent or legal guardian signs an affidavit, under penalty of perjury, indicating his/her status as the parent or legal guardian of a student who is eligible to be claimed as a dependent for IRS purposes. The notarized statement described above will be filed in the student’s permanent record, a copy will be provided to the parent, and the affidavit will remain effective for the tax year in which it was submitted. Only parents and legal guardians having an Authorization to Release Student Record Information form on file with the college are able to obtain student information. Legal guardians must provide official documentation of court ordered guardianship. Release of student information via telephone and email is not permitted by federal law. Outside agencies requesting student record information must have the written permission of the student. Pensacola State College takes every precaution to ensure the safety of its students, faculty and staff members. Pensacola State Collegiate High adheres to all safety procedures and guidelines of the college and because we are an Adult high school there a few extra procedures that have been implemented to help protect our students. The Collegiate High School has a full-time Pensacola State College Police officer who services as the School Resource Office (SRO). In addition to the campus police which is located in Building 5 on the college main campus. Please see the Campus Safety and Security Policies. The Pensacola State College Collegiate High School has cameras located in all hallways, in specific classrooms and outside the facility for safety and security purposes. To ensure the safety of all the students Collegiate High School requires that all students adheres our student ID Policy. Anyone without a Student ID is not permitted on the campus of Collegiate High School. Anyone caught without a Collegiate High School Student ID in any of the classrooms or in the building hallways will be considered a trespasser and could be arrested. Monitors tape all activities 24 hours a day, 7 days a week. Cameras are monitored in the school administrative offices and by the Pensacola State College Police Department All students are subject to monitoring while inside or outside the building.